In 1980, Abbie Conant auditioned for the Munich Philharmonic behind a screen. The orchestra voted for her appointment to the principal solo position, though the conductor, Celibidache, was opposed. Celibidache ordered that she play a “probationary year”, in which any complaints to her playing could be recorded. No complaints were recorded, but he did not award her any solos. Abbie spent the next six years playing second trombone, but she did file a lawsuit to hopefully regain her solo position. Her opposition stated that she did not have the necessary strength to lead the trombone section, and since the court would need actual proof of this, Abbie elected to take extensive medical, physical, and musical tests to prove her strength. 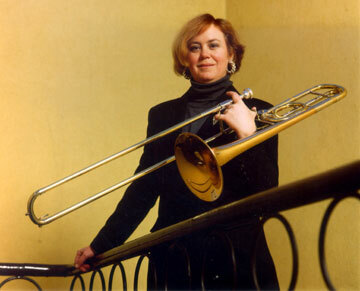 Abbie was then re-awarded her solo trombone position in 1988; however, she did not receive the salary of a solo trombonist or the back pay that she was entitled to throughout the court battles. In 1990 the Munich Philharmonic placed her is a lower salary position than all 15 of her male brass and wind colleagues. Abbie took them to court and won in 1991, but of course, Munich appealed. Abbie won the appeal in 1993– thirteen years after winning the solo trombone position with the Munich Philharmonic, she was re-awarded the solo position and received the same pay as her male counterparts. After thirteen horrendous years with the Munich Philharmonic, Abbie left the orchestra to accept a tenured position at the State Conservatory of Music in Trossingen. The Munich Philharmonic then hired a seventeen year old male trombonist with no orchestral experience. I am in complete admiration of Abbie Conant for what she endured with the Munich Philharmonic. She could have easily given up from the start, but instead she stood up for what was right. My rendition does not do Abbie’s story justice, so for a more detailed account, visit http://www.osborne-conant.org/ladies.htm#sixteen. Also, check out http://www.osborne-conant.org/Miriam.htm to see information on Miriam, a musical theater work composed for Abbie Conant by William Osborne.